Great entry bench not very big but fit perfect in the space I had. Holds a lot more stuff than I thought it would. Honey-Can-Do SHF-03423 Entryway Storage Valet, black/brown. 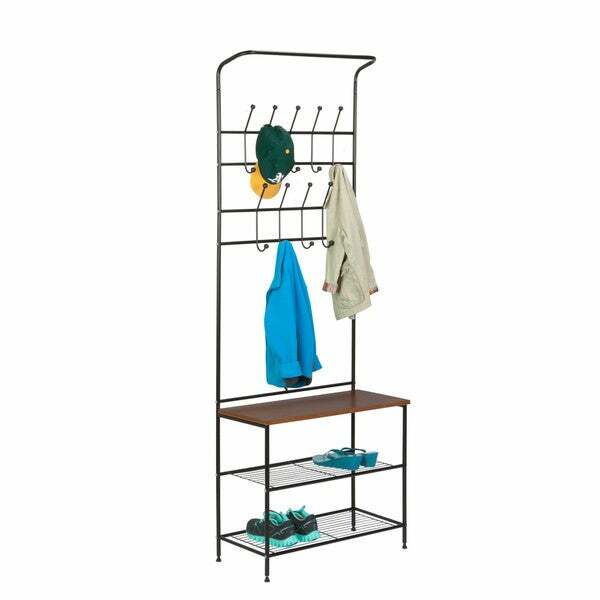 This handy entryway organizer includes two levels of coat hooks to hold hats, jackets and keys. The wood surface bench is great for setting bags, purses, or backpacks as you walk in the door. 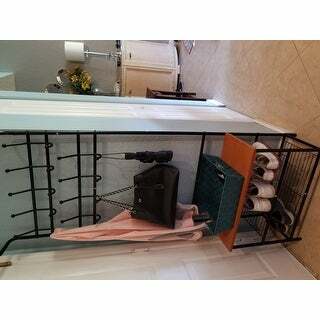 Two steel wire bottom shelves can hold several pair of shoes or baskets for gloves, dog leashes, or accessories. This entry bench is wonderful! What I like most about this coat rack/bench is that it has 9 double hooks, way more than all the other benches I looked at. It comfortably holds all my children's jackets and caps, allowing my sofa to return to it's rightful purpose of being a seat and not a coat rack! :-) The racks underneath hold 6 pairs of shoes. Unfortunately, this bench is not sturdy enough to sit on but I purchased a storage bench to sit across from this entryway bench for sitting down to remove and store the extra shoes. Great purchase! Love it!!!! Just right in every way. My apartment does not have a large entryway but this bench with hooks fits just right as you enter the living room area. I don't have to worry about my carpet getting soiled, and the bench is perfect for sitting purses and bags down to free up your hands for a minute. Did not need to attach to the wall. My husband was very pleased that he didn't have to spend more than a half-hour to put it together. My daughter saw it and loved it. Wanted to know where I bought it. I love to tell people I bought "it at Overstock ". Great bench/coat rack. It has been able to hold several winter coats. Perfect for a small space. This is study and the metal can handle heavy work bags and coats. The hooks appear powder coats and will hold up to the constant use that we plan. Serves the purpose for the price. Great for kids backpacks, shoes and coats in a tight space. Easy to put together. This product came exactly as pictured. It was very easy to assemble. You do have to be careful to not put too much weight on the hooks as it starts to lean. Looks great. I live in a small apartment and it’s exactly what was needed. Easy to put together and small enough to sit on our back stairwell. Will anchor to the wall as suggested. It looks good and well constructed. "what is the dimension for this item?" The bench is approximately 70.25 inches H. x 25.75 inches W x 12.25 inches D.
"What is the weight capacity for the bench ?" Hello Christina A., we do not currently weight test items. We apologize for any inconvenience. Thank you for shopping with us.